I am from Lexington, Massachusetts. It is just outside Boston and famous for being the birthplace of the American Revolution. Usually I tell people here that I’m from outside Boston, because people in the South usually assume I mean Kentucky when I say Lexington. Plus, I still identify as a Bostonian, despite living in the South for ten years. My undergraduate degree was in Religion. I also minored in Economics and completed (but you could only declare one minor) the requirements for an Environmental Studies minor. As part of my degree, I wrote a thesis on theories of ritual to earn High Honors. My interest in religious studies began in high school, when I elected to take Bible as Literature for one of my senior English classes. I didn’t return to religious studies until the second semester of my sophomore year of college. I came to college as a Molecular Biology major interested in genetics ethics, but only found a discussion of these issues in my first religion class – Religion, Science, and the Environment. From there, I became hooked on the study of religion. I enjoyed doing research and writing, especially the paper I wrote on Islam and the environment, where I began exploring the disconnect between belief and practice. I was given the opportunity to do projects, such as a documentary film on various traditions’ interpretations of death and suffering. I also studied in Turkey as part of an extended study class. My study of African traditional religions and theory led me to question some of the theoretical assumptions in other classes, such as Faith in a Religiously Plural World, where we read but never contested the work of Wilfred Cantwell Smith. Other than being a professor, any other interesting jobs you’ve had for a summer or longer? I was a lifeguard and swim instructor for seven summers. I had a tuition scholarship but no stipend for my masters program, so I worked a lot of different jobs. The summer before I left for Vanderbilt, I waited tables in addition to working as a swim instructor and lifeguard at a summer camp. My coworkers always mistook the smell of sunscreen and chlorine for the ocean and interacting with campers and diners were two very different experiences. With one group you could address their bad behavior. At Vanderbilt, I worked in Residential Life, first as a resident advisor and then head resident in a living-learning community. Plus, I worked as a lifeguard. How’d you first get interested in your own specialty? What intrigued you? I was first exposed to the field of religion and ecology as an undergraduate. I became interested in studying Muslim communities (especially in the United States) and the Islamic tradition, based upon my classes and studies on Islam, the diverse Muslims friends I made in college, and the media coverage after the attacks on 9/11. The increased media coverage on Muslims and Islam, along with my own increasing education and experience, brought into focus the lack of information on the role of Muslims in American and European history presented in the media. Through my studies of various theorists in undergraduate and graduate school, I began to think about the ways that studies of Muslims in America could challenge assumptions about the role of worldviews in shaping environmental action; the nature of and relationship between Islam and American culture, and the role of textual traditions within the Islamic tradition. I am on the editorial board for a journal. It’s not a committee exactly, but I’m the faculty advisor for the Religious Studies Student Association (RSSA), which has to be the best gig in town. I am working on three projects. One is my book manuscript, which analyzes the relationship between environment, culture, race, and religion in identity and community formation on American Muslim farms. Building on earlier research, I am writing an article on the Nation of Islam’s farm program under Elijah Muhammad as part of American nature religion. I started a new project analyzing Muslim environmentalists online activism for a conference presentation. I play trivia weekly. This year, our team made it to the mid-south trivia league semi-finals. I also enjoy art, in particular painting and cake decorating; running; and watching good (and some bad but I’ll never tell you which) TV programs. 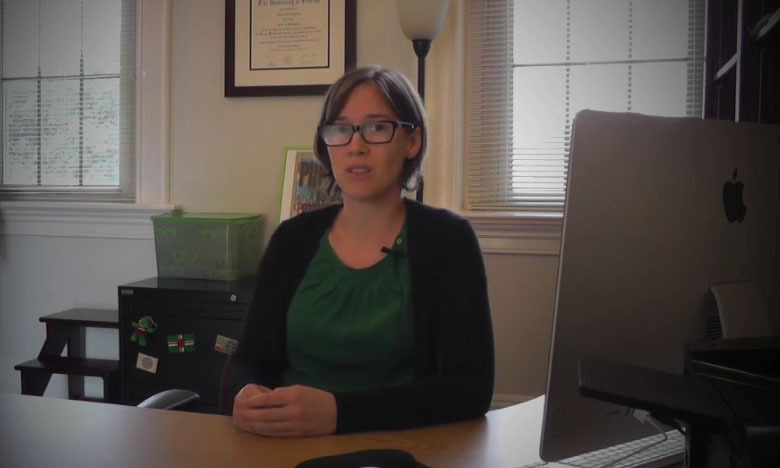 Take a look at this video which features Prof. Finnegan among other faculty members, to learn a little more about her work. To learn a little more about Prof. Finnegan, take a look at her ar·ti·facts video. This entry was posted in Faculty Blog, Relevance of Humanities, Religion in Culture and tagged American Muslim Farms, Backstory, Colgate University, Eleanor Finnegan, Lexington, Lifeguard, Religion and the Environment by Andie Alexander. Bookmark the permalink.